The post on Edutopia, Tactics for Tackling the Grading Dilemma, presents four interesting strategies for dealing with that stack of papers on one’s desk, while simultaneously raising the question of how much grading is enough grading. The author is writing from the experience of a secondary English teacher–those stacks of papers don’t go much higher than that–so not every strategy can directly translate to my elementary class. Her tactic that I like the most is the use of journals. I think that could work beautifully for the language arts period for my class, and as she recommends having different class periods turn their journals in on different days, different tables or groups within my single class could turn theirs in on different days. I love this journal idea even more for the portfolio aspect of it. Sure, often the submissions to the journal won’t be super polished, but there’s value in seeing that, too, and progression should be evident regardless. I also like the tactic of 1-in-4 grading. I don’t know if it’s my laid-back California attitude or what, but I’m not here to be a hero. I don’t intend to lay myself out as a martyr for the cause of grading, and not only because I don’t think grades should hold so much significance in second grade. Most kids at this point need practice at everything: math facts, spelling, sentence forming… Most of that shouldn’t be graded on a letter scale or go into the gradebook. And as one of the commenters on the article mentioned, there needs to be room in the gradebook for things like participation and improvement. Combining the 1-in-4 rule with the journals that are turned in weekly (but on a rotating basis), the teacher will only have to grade a few things for six or so students each evening. That can be turned around and returned to the students the following day (and in fact must be, so that students have their journals back for that next day’s work). Her suggestion of using a variety of stamps is great, too. I like how the stamps serve to do more than simply acknowledge that the student submitted something, but that they can quickly indicate the teacher’s assessment of the student’s work. And her word choice for the stamps focus on the positive aspect of the work while conveying that this work isn’t as good as it could be. The stamping tactic will fit seamlessly into an elementary class and provide an excuse to go visit the arts and crafts store. Another strategy she suggests is peer-assessment. I see the value of peer-assessment, but I don’t know how I feel about incorporating the practice widely into a second-grade class. A few of my students are really very terrible about speaking without thinking about how feelings might get hurt, or about not being able to brush off innocent-enough comments from others. I see a lot of tears and drama over peer-assessment. Plus some of the handwriting at this point is difficult for me to interpret, so that could be an insurmountable challenge for a peer. Maybe regular practice of peer assessing would wear down those rough patches and give students more empathy or thicker skin, and maybe the pressure would even improve handwriting, and it might be worth a try. But I don’t think really in-depth grading can be left to a peer at this age because it can be hard to trust their judgement, so that leaves things like math assignments that can just as easily be self-graded in a different color. And that is another suggestion: self-assessment. We already do a fair bit of that in my class, generally on things that are not significant like math homework, or where having the correct answer is more important than knowing whether the student already had that knowledge, like study guides for actual assessments. I have been trying to do more self-assessment on poster projects that come with a rubric, more so they are able to use the rubric as a sort-of checklist for earning all of the available points. She suggests having students self-assess even the more complex things, like papers, and I think, with a lot of guidance, that could be a really enlightening experience for many of my students. I think these are great ideas for reducing the grading workload and freeing up more time for creating fun, engaging, effective lessons. I’m eager to give some of these strategies a shot in my class next year. I plan to have a number of systems in place in my classroom that will indicate to my students my high expectations of them. 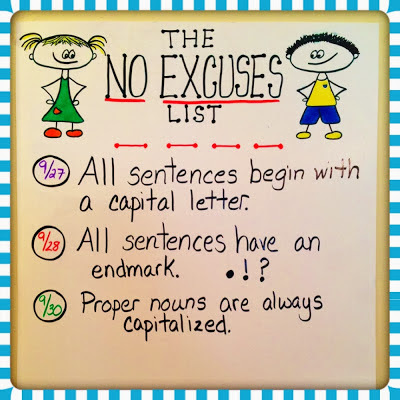 There will be predictable things like anchor charts around the room with those messages that will set the tone (I love the idea of a No Excuses List, from Teaching My Friends). I also think simple routines like this “I’m done” jar can indicate to students that we are in school to work. Have fun, make friends, create, and do work. I believe one of the contributing factors to the challenges I had with classroom management during my clinical practice was not providing enough opportunities for my quicker students to go above and be challenged. I also found I was writing “You can do better” as feedback for more than one student. Having high expectations from the start of the school year will hopefully make it so I don’t have to do that late in the year. It will be imperative to be on the look out for any of my kiddos who need some extra help meeting those high expectations. Response to Intervention is a strategy for catching those kids who may fall behind and giving them the extra support they need to be as successful as their peers. It works as a three-step approach. The first step is general class instruction, which should be of a caliber that meets the needs of about 85% of the students. The second step is a bit of extra support for the 15% for whom the general instruction is not sufficient. That extra support generally manifests as more intensive small-group work, sometimes in-class, sometimes as a pull-out. My ELLs during my clinical practice had a specialist who came into our class and supported them as needed, but my math-focus students were briefly pulled out each morning to practice skills as a small group. The third step of RTI is the most intensive, individual interventions, including referrals to special educators. An important point of RTI is the family involvement; the parents of students in my class who had intervention plans came in for a monthly meeting not just with my mentor teacher, but also with the resource teacher with whom their child also worked. I hope to work in schools similar to the school I did my clinical practice in for the feeling of community it had. A number of resource teachers were in and out throughout the day, supporting their friends but also helping any student who may need it. Those extra eyes enrich the conversations about students who may be at risk, and when combined with assessments of the quality of work the student is turning in, or even of other early indicators like a regression of handwriting skills, I hope to be able to quickly intervene with any student who needs it. This has possibly been my favorite week to date in the teaching program. We’ve been learning about how to use the standards, the end goals, when planning our teaching. It’s overwhelming to read all of these standards–I took a whole morning just reading through the English Language Arts standards for K-3–but working with these concrete goals makes what I’m doing feel real and tangible. More so because we’re not just reading them, we’re breaking them down to their simplest building blocks and comparing them to things like Bloom’s Taxonomy and talking through them and just really digging into them. At least a few of them. The backwards mapping was a good introduction to the process. I felt like it was a toe dip into the waters of being a real teacher. I would have liked more guidance because I felt like I was over-thinking and yet not quite getting it. But I do get the gist of starting a big project by knowing where you want to get and going backwards from there. Unpacking a standard felt familiar to backwards mapping, but maybe with more focus on each individual word of the standard. This word, “produce,” what does it mean??? A lot, actually. Also, the Common Core standards for fifth graders are way more intense that Virginia’s standards for third graders. Assuming I had understood everything up to that point, by the time I got to writing learning objectives, I was feeling pretty confident in my abilities. It felt like the standard and its accompanying curriculum framework (both written by the Commonwealth of Virginia) laid out exactly what they expected my students to know. I just needed to list it out in ways that would keep me and my students focused on the goal for that lesson, day, or unit, whatever the case may be. Parts of this process feels a little redundant, when the essential skills borrow language from the standard itself, and when objectives ask for those skills again. Of course, I could be missing something and be headed straight for an insufficient. I do wish we had seen this modeled in class. Perhaps that would have been dull for my colleagues already in classrooms, but I work a lot better when I have an idea of what the end product should look like, and I didn’t with this. I don’t think it would matter that we would all have to go back and do these activities for the wide range of subjects and grade levels, because I am confident I can transmute what I see into what I need. I guess what I’m saying is I don’t trust myself to teach myself, yet it feels like that’s what I’m doing a lot of the time. We’ve been learning this week how important it is to get on the front end of the classroom management train. That makes sense, of course; rules are not something you want to make up on the fly, and especially at the elementary age, kids need more guidance on appropriate ways to behave in school. Listen when other people are talking. It will also be important to have rules for the playground and when walking in the halls. Kids find all sort of ways to hurt themselves on playgrounds, but rules like “Use two-hand touch” will do something to minimize that. It’s also important that students get a quick, productive start each morning, with as few distractions as possible, so we will have procedures to come into class and put things away in cubbies or on hooks. Students will know they have work waiting for them on the board that they need to get started on as soon as possible because I will have indicated that to them from the very first day and for several days following, with reminders in the form of positive feedback often. I know that going in as a first-year teacher, I will have to keep an open mind about classroom procedures. The dynamics of a class from year to year could easily call for more specific procedures about what to do when students get silly or a little more vocal. That would be something that we discuss as a class, sitting down to talk about what strategies might work that will allow kids to be excited, while still ensuring that we’re all able to learn and that we are not disturbing other people. I can’t begin to guess what ideas students might have, but I do know that I want to encourage enthusiasm and fun–they’re third-graders, after all. And it might be a procedure we regularly revisit to check in on. More than anything else, I know it’ll be important for students to buy into the rules and procedures of our classroom. They need to see the value of everything, otherwise why would they follow them? And part of that will be them seeing me follow all of the same standards, rules and procedures that I am holding them to. Before this week I was not so acutely aware of the effect of a teacher’s expectations on her students. Peering back into my history as a student, I remember most of my teachers expecting more of me than I sometimes gave, but I certainly wasn’t able to recognize changes in my behavior as a result. The power of self-fulfilling prophecies is clear, though. If you are made to believe you are a great dancer, you will dance more often and improve with more practice and less inhibition. If you are made to believe you are a poor soccer player, you may quit the team and never improve. The phenomenon is the same in the classroom, but with more significant consequences. Teachers project their expectations of students, verbally and non-verbally, consciously or not, and students can tell. If their teacher doesn’t expect much of them, there is little incentive for students to set higher goals for themselves. It is not a direct route, but higher expectations lead to better performance, which leads to greater pride in one’s work, and then there is also the cyclical effect of greater pride in one’s work leading to still more improved performance. I look forward to working with great students. I am moving into a world of international private schools with resources and involved parents. I know that those things do not equalize student’s ability, but I know that I will not be facing all of the challenges that some of my present colleagues may have to face. I hope to slip into a system that already has high expectations of its students, where it will be easier for me to hold all of my students to high standards. In very concrete terms, I am glad to add classroom techniques to my toolbag, like giving students time to think, using fairness sticks to call randomly on students, moving constantly among all of my students, asking for more developed answers, finding and explaining the right and wrong in everyone’s answers, and more. In terms of the group assignment we completed this week, I will not hesitate to say that I was the weakest link. Carolyne started us off early, creating the glog and doling out assignments, knowing that this was a busy week for everyone. Daniel contributed probably half of all of the content on our glog. I did some work, later became indignant when it disappeared, realized I hadn’t saved it, and had to hurriedly do it again in what space remained. This group project simply was not my priority this week. A perfect, happy classroom, right? Keeping a class in line is something I’m really anxious about. When I picture myself in the classroom, I envision a pretty rosy place with lots of smiling faces and no screaming or biting or crying (again, elementary…). There’s no back-talking in that classroom, and very few hurt feelings. I’m worried reality won’t be kind to me. I understand it’s crucial that the students respect you as the teacher, and that respect is earned by being fair and consistent. It’s upsetting to hear stories about students being discriminated against by one teacher and then getting it into their head that they’re bad students and then growing into that role, potentially ruining the rest of their school career and life. There’s so much riding on being fair to all students, regardless of whether you like them personally or if they remind you of someone who tormented you growing up. I want to have a classroom with clear, simple rules that students can reference easily. I really like the idea of students being involved in the process, either helping to create our class rules or the consequences for infractions. Even younger elementary students can take ownership on that level. And then hopefully they can hold each other accountable to the rules every once in awhile. One line I’m really not sure how to walk is the one between taking students and their conflicts seriously and micromanaging everyone’s hurt feelings. In the classroom I served as the assistant, a kindergarten class, there was a lot of… tattling. A lot of crocodile tears. The teacher and I could have spent all recess sorting out who wasn’t allowing who to play with them, but often that seemed unnecessary and over-involved, and I watched experienced teachers instruct students to try to work it out themselves. I want to take my students’ concerns seriously, and everyone needs to feel safe at school, but negotiating everyone’s social network would be impossible. Is bullying like obscenity? I know it when I see it? I’m not overly worried about students liking me. Children seem to, in general. I like them, and I know that goes a long way. I could have a rude awakening in store for me, naive from my own experience of loving the vast majority of the teachers I had. I really don’t think that’s going to be my biggest problem though. Famous last words? Today’s classrooms sometimes come with computers, SmartBoards, iPads, cameras, touch tables, and more, all outfitted with more technological tools than we needed to get to the moon. When it comes to incorporating these tools into a lesson plan, is more always better? No, certainly not. Technology should be used strategically, not as ploys to entertain students or simply for the sake of using these resource-expensive digital tools. It should all start with the learning objectives of the lesson plan. These objectives should be specific and concrete; they should be measurable. They should not set unrealistic expectations. In teaching a lesson about local geography, a learning objective might be: Students will create a map of the area around the school, incorporating three features that aid in direction-giving. To get started on this project, the teacher might open Google Earth on her computer and project it so the students can see her zoom in on their school. They could discuss as a class what they see that helps them know where they are–street signs, recognizable buildings or parks, and so on. If this is an in-class assignment and students don’t have access to a class set of laptops or iPads, they can draw their own map from what they see projected, or they could go to the computer lab and work on mapping software to create their map digitally. But if the mapping software is too complex or offers an overwhelming array of options, it might distract students from the task at hand. When building a lesson plan, technology shouldn’t be incorporated simply because it is available. Be wary of it serving as a distraction or a reward before it works as a tool.